We’d love your help. Let us know what’s wrong with this preview of Shadows of the Realm by Dionne Lister. Bronwyn and Blayke are two strangers being drawn into the same war. Their world is facing invasion from the Third Realm. While they move unknowingly toward each other, they are watched, hunted, and sabotaged. When the Dragon God interferes, it seems their w This is an epic fantasy adventure book with lots of action, intrigue, creaturas and dragons, for young adult to adult. To ask other readers questions about Shadows of the Realm, please sign up. Bronwyn and Blayke are two realmist (local mages) apprentices of their distant relatives. A great threat is coming to the land of Talia which forces their masters to go on a long and perilous journey. Is sounds cliché, but I cannot say anything more without giving away some spoilers, but I will say that the plot is not what I made it sound like. This is the author's first major work and as such it has some rough edges, but nothing too serious. On the positive side, the magic system is very intere Bronwyn and Blayke are two realmist (local mages) apprentices of their distant relatives. A great threat is coming to the land of Talia which forces their masters to go on a long and perilous journey. Is sounds cliché, but I cannot say anything more without giving away some spoilers, but I will say that the plot is not what I made it sound like. This is the author's first major work and as such it has some rough edges, but nothing too serious. On the positive side, the magic system is very interesting and original. It takes a while for the plot to get moving, but once it does it gets very interesting; I was not able to put it down to go to sleep until I finished it. I also like some of the details that get overlooked in a lot of books, like the fact that when somebody is forced to kill a human being in self-defense it really leaves a long-lasting impression. The characters range from excellent leaving breathing 3-dimensional almost real people to somewhat less developed ones. The two teens I mentioned in the beginning seem moody at times, but considering their age this is realistic and justifiable. I already mentioned some rough edges. As an example the scene of a dragon sitting on a bench somehow does not compute for me. I also noticed some minor formatting problems in my ebook. Your fantasy shelf will dance with joy when you bring home this epic fantasy. Beautiful world building caused everything to seem so realistic that I was not once pulled from the story. A story that was filled with magic and dragons. If you enjoy fantasy then you will love this book. You will feel as if you've made some new friends and when you lift your head from this book you'll be surprised to find no magical beasts sitting at your feet. The book contains a surprising variety of I picked up this book knowing a little of what to expect, dragons, adventure, good vs evil. I started reading and then could not put the book down until I had finished. I lost track of time reading it. Realmists can bond with one selected animal, a creatura, and even these are well drawn with a great variety of animals used. I found it a pleasant surprise to be able to read about , as it were, familiars who range from rats to panthers. Another pleasant surprise is the way that the Creatura's point of view is also presented. This is a fabulous fantasy tale. I'm so glad it's the first in a series because I really didn't want the story to end. There is a race against time to stop the evil inhabitants of the Third Realm destroying the world of Talia. Bronwyn and Blayke, two young realmists, have been enlisted to help The Circle in the struggle to save Talia. The book is well constructed showing the two young realmist's journeys; Bronwyn is travelling with her aunt, Avruellen, while Blayke is travelling separately with hi This is a fabulous fantasy tale. I'm so glad it's the first in a series because I really didn't want the story to end. The book is well constructed showing the two young realmist's journeys; Bronwyn is travelling with her aunt, Avruellen, while Blayke is travelling separately with his uncle, Arcon. There are many dangers along the way and lots of adventure. The writing really drew me into the story and I could easily imagine what the different places and characters described in the book looked like. The storytelling is exemplary and contains many insightful observations about human nature and life. I would recommend this book to young adults and adults who enjoy getting lost in a great story. This is an outstanding debut novel. Dionne Lister is a very talented writer. I look forward to reading more of her work. "Shadows of the Realm" for me was a good book and kept me enraptured enough to not want to put it down. It's also the first novel I have read fully on my iPad which is saying something as I much prefer the feel of a book in my hand and all other novels on my iPad have remained unread. This is author Dionne Lister's first novel and it is a good first book. It did keep me engaged and wondering what would happen next and it was fairly original which can be hard in a fantasy novel. I don't remember "Shadows of the Realm" for me was a good book and kept me enraptured enough to not want to put it down. It's also the first novel I have read fully on my iPad which is saying something as I much prefer the feel of a book in my hand and all other novels on my iPad have remained unread. This is author Dionne Lister's first novel and it is a good first book. It did keep me engaged and wondering what would happen next and it was fairly original which can be hard in a fantasy novel. I don't remember any other fantasy novel that I have read channeling "magic" from other dimensions or have a "GPS" ability to read where characters are located throughout the world based on their body signature. There was decent character development, a good plot although I wasn't totally sure of the big picture and a good pace through out the book. What I did like about this book was it didn't feel like I had read it before in some other novel. I didn't get any real sense of I know what is coming next or typical character traits that all "heroes" tend to have. Dionne did a great job of giving us something fresh and a feeling of something unique. It is an easy read and you don't get lost in time changes and so much detail that if you don't stay on top of your reading, you forget important parts. My only knocks are not enough political intrigue within the nobility, a quick and unexplained disappearance that I am sure will make itself known in later novels and I don't get enough sense of dread of the consequences if the party fails to accomplish it's mission which we never really find out about it's purpose in this first novel. I guess that could be interpreted as a good way to bring the reader back for the following books. Author Dionne Lister has created something wholly unique and unexpected in her debut novel, Shadows of the Realm. The words are as dazzling as the cover. I found her use of realms and magic, a fresh perspective in the age old struggle between good and evil. The author reimagines dragons brilliantly, making them sentient, thoughtful creatures the equal of humans in compassion and rage. But, more than that her understanding of the period (that feels long ago) draws you in and won't let go. Lister Author Dionne Lister has created something wholly unique and unexpected in her debut novel, Shadows of the Realm. The words are as dazzling as the cover. I found her use of realms and magic, a fresh perspective in the age old struggle between good and evil. The author reimagines dragons brilliantly, making them sentient, thoughtful creatures the equal of humans in compassion and rage. But, more than that her understanding of the period (that feels long ago) draws you in and won't let go. Lister knows horses and fighting like the back of her hand. Despite the higher price tag $4.99, this is a book you don't want to miss. It's worth every cent. 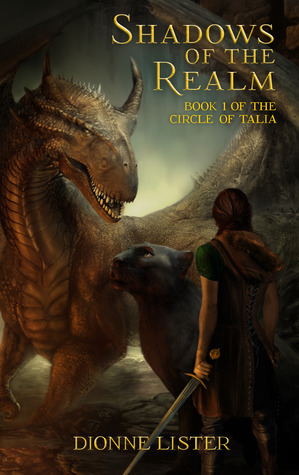 This debut novel is the first of a series (The Circle of Talia) and is a smooth-reading, delightful, high fantasy. Even readers who don’t usually head for the fantasy shelves can find much to delight in here, as did I. The writing is excellent, and author Dionne Lister deserves much more than five stars for her ability with lyrical description, which makes the reading flow so well. The characters are superbly delineated, and the action is realistic and intriguing. A good balance is achieved betwe This debut novel is the first of a series (The Circle of Talia) and is a smooth-reading, delightful, high fantasy. Even readers who don’t usually head for the fantasy shelves can find much to delight in here, as did I. The writing is excellent, and author Dionne Lister deserves much more than five stars for her ability with lyrical description, which makes the reading flow so well. The characters are superbly delineated, and the action is realistic and intriguing. A good balance is achieved between destiny and free will in the lives of the characters, an effect not always managed in fantasy stories. The world-building is also very accomplished. In fact, I encourage readers to keep an eye on author Dionne Lister and anticipate, as I am, the next installments in The Circle of Talia series. Dragon's are one of those creatures of fantasy I have always had an attraction too. I drew them, collected cards with images on them and instead of reading Judy Blume at the age of 11 I was reading Anne Dragonrider series right along with my horror books. Sure, an odd duck for a preteen girl, but than again ... I also played hostel take overs with my brother's GI JOE with the Barbie collection with the occasional Jedi Mind trick of having Barbie serve GI JOE tea (again odd duck=me). I played Dun Dragon's are one of those creatures of fantasy I have always had an attraction too. I drew them, collected cards with images on them and instead of reading Judy Blume at the age of 11 I was reading Anne Dragonrider series right along with my horror books. Sure, an odd duck for a preteen girl, but than again ... I also played hostel take overs with my brother's GI JOE with the Barbie collection with the occasional Jedi Mind trick of having Barbie serve GI JOE tea (again odd duck=me). I played Dungeon and Dragon's at lunch with the chess nerds and did not bother worrying THAT much about lipgloss (I did but I was more excited about the new sparkly set of purple dice I found at the comic shop!). There have always been dragons, and not just on the pages of fantasy books. I would like to think that someday we will discover bones of a real dragon which make the early map maker's warning be true. But in the case of Dionne Lister's books, these dragons are both terrifying as well as loveable. One critic claimed she thought she was reading high fantasy and found she wasn't. Obviously does not know the definition of high fantasy. Dionne Lister complies to all the aspects of what high fantasy is suppose to do. It has characters who are young and not worldly. There are wise mentors with mysterious pasts raising and guiding the youths into the future. A way of life and world is in need of saving and only a few can do it and are prophesied too. There is magic all around and in every part, not just with a wave of a wand or a wiggle of a nose but in the prose. Mystery and darkness, good and evil are present and at odds. Honor, dishonor and a past event which changed the world and paths of all, happened at one point affecting the main players. And the big part?? DRAGONS!! This time they are not just hanging on a wall or in legends, the story is steeped and truly centers around them! How does it make it any different and why should you try this series out? ...these same dragons had also started rumours that some of them occasionally liked to eat people. Zim, however, was not one of these dragons." - Shadows of the Realm - on the prince of the dragons. I would like to say Dionne waved her magic wand and sent a big bad Dragon to threaten to clear my McDonald's of workers and prevent my occasional feasting on nuggets, but the truth is she wrote an epic fantasy that was not an 800 page tome with so many convoluted names and so many different storylines my 13 year-old, as smart as he is would be put off! Don't get me wrong, I occasionally live for those tomes, I am a huge fan of David Eddings and Robert Jordan and Zelazny but the themes are not approachable for all the ages. Then she comes up with these absolutely beautiful images, the descriptions are not that of a police blotter. She is able to say how someone looks and how they are as a person all in a couple sentences. Dionne's story and characters are written into a realm that is approachable and readable for anyone from the age of 12 to 99. Everything which is taken to be the conventions of an epic fantasy novel is here but written with the young adult in mind. She has woven the characters and stories in with humor and given her readers real people to believe in and cheer for. Her teens in this coming of age are real, they are moody, snarky, occasionally rude and in need of discipline and guidance all the time. They are not savants in the realm of propriety and manners, they are like the same gifted children you have in your house, their appetites are bottomless, they huff and puff and think the world revolves around them They grow, learn and realize as the stories go on the world revolves around everyone and more than that, especially in this series. Like any good fantasy, there is much more than meets the eye. These things alone makes the story a wonderful read for young adults! She makes the dragon's a little over the top, superior and full of pomp and circumstance, but best of all, she makes them funny and likeable. There are some very real and serious situations that come up that are intense and frightening. I found myself holding my breath at times waiting to find out what the story held for the characters I was so invested in. From the very first sentence I fell in love with a young boy who was interested in catching frogs yet who dreamt of a frightening creature threatening his life and following with the introduction to our female teenager who was going to throw herself off a cliff because of being forced to leave the only life she had known. Epic is right, over the top and yet at the same time real. A teacher once told me a reader does not get invested in the story, they get invested and care about the characters, the story just follows behind them. This was certainly true with both of these books. I can't even put my finger on one specific thing she has done, it is everything from her wonderful colorful writing to her believable loveable and despicable characters. I laughed out loud, I sobbed with grief and sighed with relief all the while unable to stop reading (I am not kidding, go check my sharing on this book). The magic system is original and touching, the evil is dark, the good are not perfect and even though there are gruesome scenes of real horror these just lead to it all being an amazing tale. This is the first book, and it has an incredibly intense cliffhanger. I was so glad I had book two. You will find a place in your heart for so many of these characters, I wonder though, which one is yours? - All stories were about the youthful and inexperienced. - There was always a wise old mento Fantasy is trite. - There was always a wise old mentor. - Dragons entered, somewhere, in the story (if in no other place, heraldry). - Mysteries dripped from the pages. Let me say something that, while reading Shadows of the Realm: These thing are, while in many respects tropes, quintessential to the proper telling of a fantasy novel. That is, in the end, why we read them. What is unfortunately true for most fantasy novels, is that these points of interest in novels are rarely handled well and, as a result, feel abused and boring. Dionne Lister has found a way, quite a mystery to me, to make the stories of these plot points actually quite fresh. There is a vigour to the writing styles and a sort of, unabashed reality, that (despite being in the fantasy genre) makes the story feel very real. Perhaps it is the unique way in which she's created the magic system for her world, or perhaps its the way in which the characters feel like they have been there, living their lives, before our intrusion, but whatever the case may be... The story is enthralling and highly reminiscent of why I loved fantasy novels as a child. I hope that the author does not dawdle... I am waiting for the sequel with no small degree of excitement and interest (to a minor extent, annoyance that it hasn't already been finished). It is some time since I read a fantasy book in the Tolkein vein. While I am a longtime admirer of the sword and sorcery writings of Michael Moorcock, Tolkein himself has always left me cold: impressive if verbose world-forming but too many seemingly endless journeys and (at least to my mind) laughably naive and one-dimensional female characters. So I must admit, I approached Dionne Lister’s “Shadows of the Realm” with a degree of trepidation. Many of the elements of the Tolkein epic feature stron It is some time since I read a fantasy book in the Tolkein vein. While I am a longtime admirer of the sword and sorcery writings of Michael Moorcock, Tolkein himself has always left me cold: impressive if verbose world-forming but too many seemingly endless journeys and (at least to my mind) laughably naive and one-dimensional female characters. So I must admit, I approached Dionne Lister’s “Shadows of the Realm” with a degree of trepidation. Many of the elements of the Tolkein epic feature strongly: the disorganised, squabbling, ill-prepared forces of ‘good’, the undertaking of a quest, rites of passage for young, inexperienced protagonists, ‘wise’ elders, mythical creatures and a ruthless, bloodthirsty adversary. However, where Ms Lister scores over Tolkein for me is the way she vividly creates her world of Talia with a few deft strokes. Her characters are people we can identify with, possessing recognisable human failings and frailties – and she creates 3D female characters (some of whom are happily rather snarky). They are ‘real’ individuals, not ‘representatives of races’ imbued with generic characteristics. The story moves along at a cracking pace and the author skilfully structures the progress and interaction of the various strands of the story. The writing is tight and literary in tone and requires the reader’s concentration. Although I was reading fantasy it certainly did not feel like YA material. The novel ends on a cliffhanger – well, several actually – and there is clearly a lot more story to unfold presumably over several other books. In summary, I’m a convert. Well played, Ms Lister. Look after my sword, would you, while I settle down to read the second instalment? And keep your eyes open for flesh-eating Gormons while you’re at it. I think Shadows of the Realm is a very entertaining read. As I progressed through the book, I wanted to learn more about the many characters that were introduced. I think the fantasy world in which the Realm was set was different and interesting, and the interweaving of the various strands of character action made sense. I liked the fact that there were both human and otherworldly villians in the story. While I am certainly not an ex I received a copy of this book in exchange for an honest review. While I am certainly not an expert writer myself, it seemed that the transitions from one piece of story to another jumped kind of abruptly at some points in the book. I guess what I mean is that the flow of storytelling is a bit uneven in places. One thing I was happy to see is unlike some other indie novels that I have read on my Kindle, the book contains few, if any, grammar mistakes. If they are there, they are certainly small enough not to distract a math teacher from the story. Wow! Let me say again. Wow! It is not often that you find talent stepping out of the shadows to stand beside authors such as Lewis, Tolkien, or McCaffrey. I will not be surprised to see Lister join the ranks of the great fantasy writers who have become household names. Dionne's new book Shadows of the Realm starts with a flourish immersing the reader into action from the start and keeping pace throughout the story. Intrigue is your constant companion as you travel the long dusty roads of Talia Wow! Let me say again. Wow! Dionne's new book Shadows of the Realm starts with a flourish immersing the reader into action from the start and keeping pace throughout the story. Intrigue is your constant companion as you travel the long dusty roads of Talia with Bronwyn and Blayke, two young Realmists' who must leave childhood behind to face adventures ahead. What lies ahead? Dragons of course! Lister moves her characters ahead at a fast pace being chased by unseen assassins and hidden plots to prevent them from fulfilling their quest to save the world from impending evil. I found the characters in this story not only believable but very likable. The story line was fresh and exciting, and ended much to soon leaving me anticipating book two. I won a copy of this book and yes, I was lucky. The story is steeped in imagination, magic and enchantment, with characters that bring it alive in the most realistic way. The writing is superb, with wonderfully rich descriptions, creating fantastic detailed worlds. The building of characters was excellent, so that readers have no choice but to care about what happens to them...rooting for the good and hating the bad - and with the right degree of uncertainty. I also found the story original in pa I won a copy of this book and yes, I was lucky. The story is steeped in imagination, magic and enchantment, with characters that bring it alive in the most realistic way. I also found the story original in parts and was fascinated by the ideas of several realms and how they could be used for 'magic'. The 'bonding' sequences were particularly intriguing and were portrayed amazingly well. The only downside was that I will have to wait until the next book to find out what happens! I do not give spoilers, but will say that overall this book hooked me from start and I didn't want to put it down - an excellent tale that I highly recommend. Adventure and reaching into a puddle trying to grab a frog is something I know about. Who would guess that I was a tomboy growing up? I know about thunder booming and rain falling before being able to get to shelter. One thing I am glad I don't know about is giant creatures bellowing screams like the ones that assaulted Blayke. When Blayke is asked, "How would you feel about leaving this paradise tomorrow?" He answers, "I'll start packing." I especially liked the journey the author takes her char Adventure and reaching into a puddle trying to grab a frog is something I know about. Who would guess that I was a tomboy growing up? I know about thunder booming and rain falling before being able to get to shelter. One thing I am glad I don't know about is giant creatures bellowing screams like the ones that assaulted Blayke. I especially liked the journey the author takes her characters on with the picture drawn in such a way that keeps the reader enthralled. I think when you start reading this adventurous fantasy about magicians and dragons - you might just pack this novel in your belongings so you can continue reading until you finish it. This book captured my attention from the very first. In my opinion, and I have read many, many fantasy and otherwise books, this new author, Dionne Lister has the potential to rise to Anne McCaffrey, Jim Butcher, and other great traditionally published authors. What makes her truly exceptional, is the fact that she is an indie author. This book will have you laughing, crying, at the edge of your seat in anger and fear. It is well worth the time to read. Epic fantasy is not generally my genre of choice. The stories are great but I prefer something that follows a faster pace and epic fantasy seems to take longer to get to the next exciting part. I loved this book though even though it was an epic fantasy. I fell in love with the characters easily and the plot was easy to follow. The concept of the story is a time honored tradition of there is bad out there and the good guys must jour I received a copy of this book in exchange for an honest review. The concept of the story is a time honored tradition of there is bad out there and the good guys must journey to stop it. In this journey we find several people with ability to connect between realms and meet to decide the course that they need to take to fight the bad guys. Unfortunately the bad guys have access to that realm as well and work very hard to not only infiltrate but actively sabotage their foes. The novel is long and has a lot of twists and turns during the journey but this allows the reader to become part of the story. I felt pulled into the scenery right from the first page and the author was able to keep me not only interested but in the action as well. The only issue that I found other than the length (which is my personal preference) was the lack of a conclusive ending. I felt as I was Bronwyn standing at the edge of the cliff as she was in the opening of the book. I was on that edge not knowing what was to happen next. I hope that Dionne Lister writes a second novel about this because I am dying to know what happens next. To start off with, I really enjoyed this book, it was, fun, interesting and the relationship between the families reflected actual family relationships. - I liked the way that the story was told from different characters points of view. It created a higher insight into what was going on in different parts of Talia and how they were all working towards the same thing, just from different areas. - The characters were engaging and you could relate to some, love some and hate oth To start off with, I really enjoyed this book, it was, fun, interesting and the relationship between the families reflected actual family relationships. - The characters were engaging and you could relate to some, love some and hate others. - The creatura were something that I hadn't seen before in a book and I really enjoyed the bond that they had with their partners......I really wish I had a creatura now. - It is an intriguing book and gradually got better throughout the story. - The characters were introduced very quickly and without much description as to who was who. It did become easier to figure this out the longer you read through the book. Maybe it was just me who had trouble figuring it out. Though mostly light and gentle in tone, the story delves into just enough dark places to allow mature themes to be explored by the young adult reader. I found this added depth and respectfully subtle moral lessons to the coming-of-age journeys of Bronwyn and Blayke. However, the fun and cheekiness served by the surrounding characters balances it nicely. This was a great read. It contained all the epic fantasy I could have asked for. The story is told from the perspective of several groups of Realmists (the magicians who draw their power form the second realm) who are converging on the Dragon city to fight to save the world from the evil Gormons from the outer realm. It was engaging and kept me reading when I should have put it down and gone to sleep. The author has created a cast of characters that kept my attention throughout. I found that I had This was a great read. It contained all the epic fantasy I could have asked for. It was engaging and kept me reading when I should have put it down and gone to sleep. The author has created a cast of characters that kept my attention throughout. I found that I had to keep myself from rushing through it, just to find out what happened next. The magic of the Realmists worked well and she demonstrated how they learned and grew in their power. I particularly liked the bonding test that the Realmests underwent when joining with their creatures was well done and fresh. Overall I was very pleased and look forward to the next book in the series. This was a great book. I am new to this genre and I wasn't sure what to expect, but Dionne Lister is wonderful at drawing readers in to the fantasy. I would definitely recommend this book and I hope a sequel comes to us soon! A free ebook I liked it and have now to think about buying the rest of the series. Ms. Lister has written a jewel of a young adult fantasy story for the reader who enjoys an adventure with imagination. The plot draws the reader in from the get go, by setting the ground work for a series a young reader will want to complete. Our young protagonists are Bronwyn and Blayke. At the age of eighteen, they’re sent on separate paths towards their destiny by The Circle of Talia. Their antagonists are coming of age, again, from another realm, as our main characters are being mentored into becoming realmist. A spirit the reader will learn about as the story progresses. The author has ingeniously interwoven morals and philosophy into the teachings of our young realmists. Bronwyn’s mentor Avruellen teaches her, paraphrased, ‘As you’ll come to realize over time…no amount of worrying will help to solve a problem for the better or the worst.’ Tidbits like this will get the reader thinking in the right direction. After the tedious part of laying out the background of the story and the characters involved, Dionne Lister’s adventures takes off. The reader, with the basic intro knowledge given, will be reading rapidly to see what next happenstance will develop. This is Book 1 in the series The Circle of Talia. Ms. Lister will have the reader thinking and saying, “Don’t end now; not at this point, I want to know what will come next.” And that is Book 2. The author has done her job. She has hooked the reader into her fantasy which he or she will want to continue, and they should to settle their restless minds. Otherwise, how will the reader know the end of the adventure? Buy the series to keep the flow going. It’s worth it. Reading this took some focus and time, which is kind of surprising as I look back. The initial wording felt weak and juvenile to a point where my interest waned. It's not that I need grown-up words to form sentences but I felt it was more of "See Spot run. Spot runs far." Somewhere in the middle of the book, I wondered if I would finish the book. And I am glad I did. The premise behind the story was sound and intriguing. A new magic system and a precious few who were trained in its nuances - real Reading this took some focus and time, which is kind of surprising as I look back. The initial wording felt weak and juvenile to a point where my interest waned. It's not that I need grown-up words to form sentences but I felt it was more of "See Spot run. Spot runs far." Somewhere in the middle of the book, I wondered if I would finish the book. And I am glad I did. Jump into a world of fantasy! Brilliant world building that really took me to another world. The breathtaking imagery had me eagerly devouring each word. I really enjoyed the imaginative world and its memorable inhabitants. Filled with adventure, intrigue, and dragons you will not want to put this book down! The voice of the story was beautiful and fun. It really drew me into the heart of the story. I love the intricate plot of the story and seeing this new world through the eyes of the two charac Jump into a world of fantasy! The voice of the story was beautiful and fun. It really drew me into the heart of the story. I love the intricate plot of the story and seeing this new world through the eyes of the two characters Bronwyn and Blayke whose worlds are both being torn apart by the same war. They are strangers, but their plight is the same. This story also had some intriguing coming of age elements that I thought were very well executed. The two different viewpoints were handled nicely and added to the depth of the story instead of detracting from it like different switching different viewpoints can do sometimes. This book was an exciting adventure story that every dragon lover should read! I cannot wait for the rest of this series. This is the first fantasy novel I have read and I was not sure what I would make of it but I really got pulled into it. The story got more and more fascinating as I read. The characters grew on me quite quickly, especially Fang! The universe that Dionne Lister has created here is moorish. Sometimes I've found stories can get bogged down when describing a setting but here those details were well woven into the story. This is the first in a trilogy I believe and I am absolutely looking forward to f This is the first fantasy novel I have read and I was not sure what I would make of it but I really got pulled into it. The story got more and more fascinating as I read. The characters grew on me quite quickly, especially Fang! This is the first in a trilogy I believe and I am absolutely looking forward to following this journey these characters are on.